Main focus: Increase strength and tone in the abdominals, back, and shoulders. Without CoolBoard: A Plank done on the floor fixes your hands and feet relative to each other, so the only work being done is in holding your body weight. With CoolBoard: Now your hands can move in all directions. Your body must control and minimise that movement so more muscles must do more work. 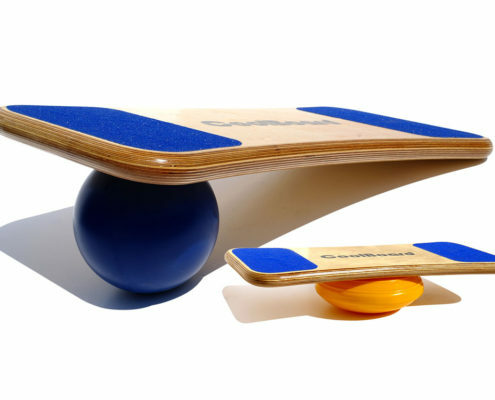 Your core and many stabilising structures must constantly work to hold the CoolBoard steady while executing the plank. Get the ‘V’: Now try sliding the CoolBoard to one side, which moves the emphasis one side of your abdominals like nothing else, then slide to the other. This is the best exercise for getting that perfect ‘V’. No other exercise is as effective.